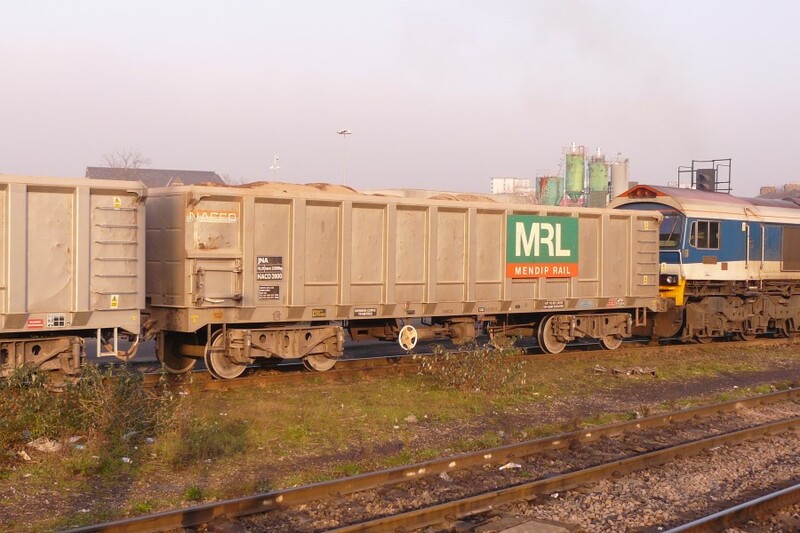 Summary: The large fleet of wagons used to haul stone from the Somerset quarries to London and the South East was partially renewed in 2000/2001 with the arrival of 90 rugged-looking box wagons built by Marcroft. These were the first to carry the logo of the recently formed Mendip Rail company, other types continuing with the Yeoman and Hanson brandings. They were also the first to use the TF25 low track force bogie. History: Wagon hirer Nacco UK Ltd placed an order for 20 of these wagons in 1999 with delivery commencing from builder Marcroft Engineering of Stoke in early 2000. They were the first production wagons to be mounted on the new TF25 'Track Friendly' bogie developed by Powell Duffryn Rail Projects and were for use by Mendip Rail, the joint company set up to run trains from Merehead (Foster Yeoman) and Whatley (Hanson, formerly ARC) quarries to terminals in London and the South East. The new bogie design had already been tested on CAIB3469, one of the bogie ballast box wagons converted by Marcroft in 1998 for use by Railtrack, as well as on tank wagon PR85309 and, later on, a pair of Yeoman's O&K-built JYA bogie box wagons. The design had a slightly unusual appearance with substantial side frames and prominent dampers in front of the axleboxes. The wagons themselves were fairly conventional bogie boxes, with heavy vertical ribbing and top capping, a large square door for cleaning access at the left hand end, and a steel loop ladder at the right. They were painted silver with a large side board spanning several body ribs. On this was the MRL logo on a green background, and titling on an orange band. As with earlier aggregates wagons, automatic couplers were to be used within sets and the intital order was split into two rakes of ten. All wagons were assigned TOPS code JNA-A and the batch was numbered NACO3900 to 3919 with the outer wagons being NACO3900/3909/3910 and 3919. The first traffic use for these wagons took place in May 2000 when they started working between Merehead and Harlow Mill. By this time an order for a further 35 wagons had already been placed and construction started. The second batch was delivered towards the end of 2000 and were again JNA-As, taking numbers NACO3920 to 3954. The order appears to have comprised two rakes of 12 plus one rake of 11 wagons, the outer wagons taking numbers 3920, 3931, 3932, 3943, 3944 and 3954. However, the design codes suggest that NACO3950 was also an outer wagon. The original design codes for these two batches is not known but would logically be JN057A/B for the outer wagons and JN058A/B for the inners. A third batch of 35 wagons was delivered in early 2001, this time owned by Caib UK but otherwise very similar to the earlier examples. Construction was again by Marcroft and the order included 8 outer wagons and 27 inners, enough to form 4 sets of eight wagons plus a few spares. The numbering method was changed such that all the outer wagons were numbered consecutively as CAIB3955 to 3962 (JNA-A to design code JN057C) and the inners as CAIB3963 to 3989 (JNA-A to JN058C). In service the wagons appear to have replaced the broadly similar Procor-built JNAs and the former iron-ore tipplers of types JTA and JUA. The wagons from all three batches are operated as a single fleet and sets (of up to 14 wagons) seem to only include this type, although consists can include additional sets of other aggregates types. By 2008 the design codes had changed somewhat, presumably as a result of minor modifications. Most of the Nacco-owned inner wagons were by then JN058E (apart from one set that became JN058F), while the outers were JN057D (apart from the same set where the outers became JN057E). NACO3900 and NACO3950 were recorded as being to JN058H, suggesting that they were inners, but at least NACO3900 is confirmed as being an outer. The Caib-owned batch had become JN057F and JN058G (apart from one stored wagon still shown as JN058C) respectively. JNA NACO3900 at Acton Main Line, 20th December 2007.